My Journey with Maya Angelou: Tavis Smiley Remembers Legendary Poet & Civil Rights Activist | Democracy Now! public television and radio broadcaster. His new book, co-written with David Ritz, is called My Journey with Maya. In his new book, “My Journey with Maya,” the television and radio broadcaster Tavis Smiley pays tribute to the late Maya Angelou, chronicling their nearly three-decade-long, multi-generational friendship. Smiley was 21 and Angelou was 58 when they first met in the mid-1980s. The book brims with the renowned poet’s words and Smiley’s remembrances of how she guided him through challenging moments in his life. The book’s release coincides with the U.S. Postal Service’s unveiling of a new limited edition forever stamp in Angelou’s honor. AMY GOODMAN: “Run Joe” by Maya Angelou, from her 1957 album, Miss Calypso. This is Democracy Now!, democracynow.org, The War and Peace Report I’m Amy Goodman, with Nermeen Shaikh. 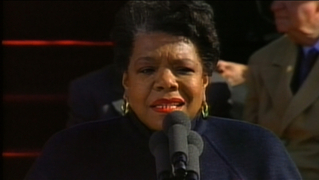 NERMEEN SHAIKH: We end today’s show remembering the late poet Maya Angelou. MAYA ANGELOU: Great souls die, and our reality, bound to them, takes leave of us. Our souls, dependent upon them, upon their nature, upon their nurture, now shrink, wizened. Our minds, formed and informed by their radiance, seems to fall away. We are not so much maddened as reduced to the unutterable silence of dark, cold caves. And then our memory comes to us again in the form of a spirit, and it is the spirit of our beloved. NERMEEN SHAIKH: Maya Angelou, the legendary writer and civil rights activist, reading her poem, “When Great Trees Fall.” This May marks Angelou’s one-year death anniversary. Well, we spend the remainder of the hour honoring Angelou through the memories of her friend, the public TV and radio broadcaster Tavis Smiley. His new book is called My Journey with Maya. It chronicles their nearly three-decade-long, multi-generational friendship. He was 21, and she was 58, when they first met in the mid-1980s. The book is brimming with the renowned poet’s words and Smiley’s remembrances of how she guided him through challenging moments in his life. AMY GOODMAN: The book’s release coincides with the U.S. Postal Service’s unveiling of a new limited edition forever stamp honoring Maya Angelou. The stamp bears a picture of Maya with the quote, “A bird doesn’t sing because it has an answer, it sings because it has a song.” But the stamp has caused a controversy after it emerged the quotation is apparently not Maya Angelou’s. Children’s book author Joan Walsh Anglund said she wrote it first in a book of poems published in 1967. But she said she didn’t mind it was identified with Maya Angelou because she said she hoped that her writing would subliminally affect people and shape children as she had written it as a children’s book. For more, we’re joined now by Tavis Smiley, speaking today at the New York Public Library at noon, then at the Union Square Barnes & Noble tonight at 7:30. The book, My Journey with Maya, co-written with David Ritz, now being adapted for Broadway by Kenny Leon, the Tony Award-winning director of A Raisin in the Sun. Tavis Smiley, welcome back to Democracy Now! TAVIS SMILEY: Good to see you, Amy. Good to be on here with you, Nermeen, as well. AMY GOODMAN: Congratulations on this lovely book. AMY GOODMAN: When did you first meet Maya? TAVIS SMILEY: When I was 21, I was a young aide to the Tom Bradley, the late, great mayor of my city, Los Angeles, and Dr. Angelou was coming to town for an event. The mayor could not attend the event, and as aides are often assigned to do, I had the great honor of going to present her a letter, a proclamation. And I was literally in her presence for just five minutes, Amy. But in that five minutes, I felt something so powerful and so strong, I vowed to myself at some point in my life I have got to get myself back into this woman’s space. I had no idea that some years later I would be invited by her to go on a trip to Africa for almost two weeks, and my assignment literally was just to carry her bags. And for two weeks I carried her bags around Africa, but that didn’t stop her from allowing a friendship to blossom. I mean, she was already iconic at that point. This was in August of 1983—1993, rather. So, in January of '93, she of course had delivered that poem at Bill Clinton's first inauguration. So she’s already, again, world-renowned, and I’m just a nobody, but we’re hanging out together in Africa for a couple of weeks. And even though that distance between what she had accomplished and what I had yet begun to do was so broad, she enveloped me, she embraced me. And 28 years later, until she passed away last May, we had a wonderful friendship. NERMEEN SHAIKH: So could you explain—you talk about it very powerfully in the book—the significance of that trip for Maya Angela to Ghana? NERMEEN SHAIKH: And also for you? TAVIS SMILEY: She had lived in Ghana earlier in her life, so for her it was sort of a homecoming, and they rolled out the red carpet for her, for Maya Angelou. Long before I had ever heard of or met a guy named Barack Obama, I met a black president, an African president of a country called Ghana, whose name was Jerry John Rawlings. We were staying at the presidential palace. So here I am, a 20-something-year-old kid. I’m hanging out with Maya Angelou. I’ve never left the country before, except maybe going across the bridge from Detroit to Windsor, Canada. But I’d never left the country. So, I’m going to Africa for the first time. I’m out of the country for the first time. I’m going to the motherland. I’m going with Maya Angelou. I’m staying in the presidential palace. I’m meeting the president of Ghana. And Maya is speaking at this international conference. And guess who walks in the room, Amy. Stokely Carmichael. And behind him walks in Miriam Makeba, and then walks in the great historian, John Henrik Clarke. I’m a 20-year-old kid. I’m taking all this in. So it was significant for her, to your brilliant question, because she was going home, as it were, back to a place she had lived prior. But, for me, I had run for city council in Los Angeles and lost this race. I know it’s hard to imagine—I laugh at it now, but it wasn’t so funny then. I’m in my mid-twenties. I’ve run for city council in L.A., and I’ve lost. But because all I ever wanted to do was to be a public servant—and I make a distinction between being a public servant and a politician. As you know, my hero has been for all of my life Dr. King, so I thought that public service was my way to express this gift that I thought I had of loving and serving people, so I wanted to run for public office. I run for city council, and I lose. But because I had no other goals or plans in life but to serve people, I literally didn’t know what to do. I was lost. I didn’t know what the next step in my life was. I didn’t know how to find my own voice. What is my calling in the world? The only thing I think I was ever born to do, I just failed at. What do I do now? It was a very serious and depressing moment for me. And so, into that very space steps this—comes this invitation from Maya Angelou to go to Africa, and I started this journey of trying to figure out what my role in the world was. AMY GOODMAN: Maya Angelou, reading from her poem, “Still I Rise.” And according to The Guardian and BBC, Nelson Mandela recited “Still I Rise” at his inauguration for president in 1994 in South Africa. I want to go to Maya with Tavis on January 20, 2009, when Maya Angelou appeared on The Tavis Smiley Show and discussed the inauguration of President Barack Obama, the first African-American president in the country’s history. This is Tavis Smiley interviewing Maya Angelou on that historic day. TAVIS SMILEY: When you say, “I can do it,” it obviously makes me think of that phrase that we all know now, etched in our brains, “Yes, we can.” And that “Yes, we can,” of course, courtesy of one Barack Obama. TAVIS SMILEY: So, in a matter of hours from now, in a matter of hours from now, this country will inaugurate its first African-American president. And what’s that grin that I see on your face about? TAVIS SMILEY: Oh, yes. Oh, yes. TAVIS SMILEY: Your dear friend, Jimmy Baldwin. AMY GOODMAN: That is Maya Angelou being interviewed by Tavis Smiley on his show. So, Tavis, this was an area that you and Maya disagreed over fiercely. 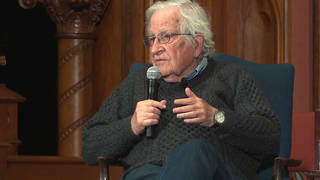 AMY GOODMAN: Talk about your fights. And talk particularly about her and your assessment of President Obama. TAVIS SMILEY: First of all, when I see that video of Maya and I talking—I interviewed her over a dozen times. I mean, imagine I start as a kid in Africa trying to figure out what my role in the world is, and over 28 years she saw me blossom and saw my career unfold, and she ends up being a guest on my programs over a dozen times. And it just—my skin just tingles every time I see myself in conversation with her, because I adore her so much. But to your point, we disagreed on a number of things. But the beauty of that is that, you know, she allowed me to interrogate her. She welcomed hearing my opinions and my point of view. She wanted to have a contestation of ideas, so that both of us could be made better. She started out a strong supporter of Hillary Clinton in 2008, obviously, because she had Arkansas roots. She is from Stamps, Arkansas. Bill Clinton, as we all know, is from obviously a place called Hope. So, they are friends from their Arkansas days, so she starts out supporting Hillary. When Barack Obama wins the nomination, she obviously supported Barack Obama. And there were people who thought that my commentary and my questions were a bit tough on the candidate. People thought that you were a bit tough on the candidate. And that happens in our business, when—you know, when we raise questions that I think, and you believe ought to be raised. These are critical questions that have to be raised. People have to be held accountable. And you don’t do it just to the Bushes; you do it to the Clintons, and you do it to the Obamas. And that’s what your role is on this great program, and I celebrate you for that, and that’s what my role is. She understood it, and that conversation ended, as did every conversation, because there are a number of things in the book you will read that we had debates about—about Barack Obama, about the N-word. One of the worst mistakes that I think she ever made—and I love her—was writing that op-ed, Amy, in The New York Times to support Clarence Thomas when he was nominated. We disagreed about that. We had a long-running debate, lovingly, about what we thought was the greatest of all the virtues. And she asked me one day, “What do you think the greatest of all the virtues is?” I said, “For me, it would have to be love.” She said, “No, I think it’s courage.” And for 28 years we had a debate about which is the greatest of those virtues, love or courage? We never settled that. Even after she died last year, there’s still no winner, no definitive answer to that debate. But my point is that every difference that we had, Amy, always ended on a love note. She never allowed any conversation, no matter how tense or terse, to end on anything but a love note, and our friendship always remained intact. AMY GOODMAN: Well, Tavis Smiley, we want to thank you so much for being with us. AMY GOODMAN: Tavis Smiley, a journalist, public TV and radio broadcaster, his new book is called My Journey with Maya. He’s speaking today at the New York Public Library at noon, then at Union Square Barnes & Noble at 7:30.